Imagine the world 10, 20, 30 years from now. What would sneakers look like? What sort of features would you want to see? Lights. Auto-laces. Smartphone App Control? The future now has a name; Nike Adapt BB. The dream of rocking self-lacing sneakers has been around since Marty McFly first rocked his Nike MAGs in 1989. But most previous attempts at creating smart sneakers failed before. Integrating such technology in sneakers without jeopardizing the design or performance is very delicate, and costly. The idea that you can imagine the future and Nike can create it, is mindblowing. And for such sneakers to be available for purchase online is just perfect. Targeting the needs of professional BB players, and performance shoes fans, Nike has created its most innovative fit solution to date. The all-new Nike Adapt is not a regular shoe, it’s more like a platform that creates a real custom fit experience. 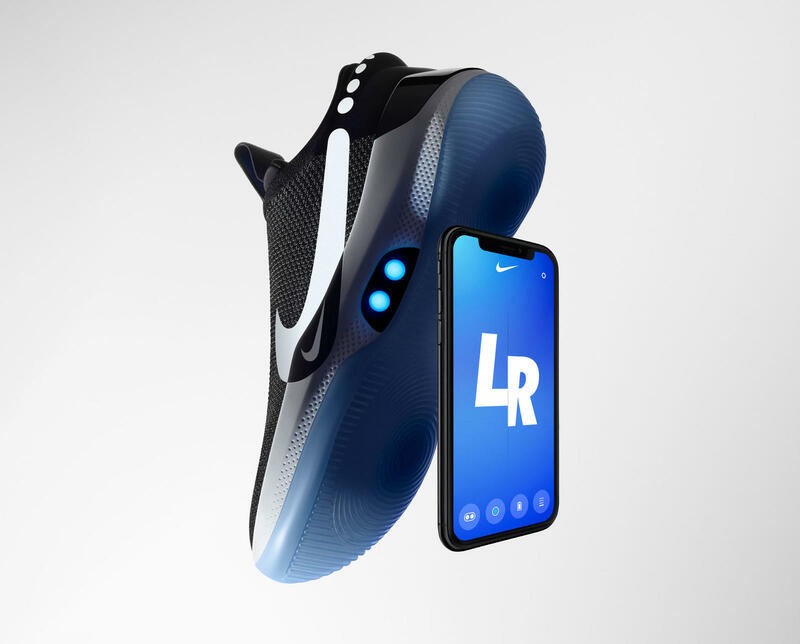 It features an advanced power-lacing system, a smartphone app, and continually updated firmware, embedded in the new Nike Adapt BB basketball shoe. What you can’t miss is the Air Mag “Back to the Future” vibe you feel the first time you see the Nike Adapt BB. We KNOW the OG Air Mags weren’t really self-lacing, but they hinted at the possibility of producing such shoes. And after the 2016 version of the Air Mags which was self-lacing, Nike is releasing a pair that you can cop, and afford. The Nike Adapt BB adjusts according to every person. It senses the tension needed by the foot and changes fit to keep the foot locked in. By manual touch or by using the Nike Adapt app on your smartphone you can either loosen the shoes or tighten them up, for better grip. Depending on the settings you’ve set already, your sneakers will feel yours, at all times. As Nike plans to provide continuous updates for the firmware, you’ll be able to enjoy an even more precise, and customized fit. This is highly correlated with the stock of the sneakers. It’s still not very clear whether or not the Nike Adapt will be limited enough to have a resale value. What is clear, however, is the high retail price of the Nike Adapt BB. $350 is a lot more than what you’d usually pay for Nike sneakers. But what you’re getting in return is worth it. Looking back at how much the Nike Hyperdapat made when first released, you can see there’s hope. But the secret lies in selling ASAP. Especially since Nike is planning on bringing FitAdapt to other sports and lifestyle products. So if you’re not going personal with these, make sure you ride the first wave of “Asks” and make the most out of your cop. The Nike Adapt BB sneakers will be available for purchase in February 2019. As we wait for more detailed info, you can take a look at Adidas version of the adaptive fit basketball sneakers, N3XT L3V3L. Which, conveniently, will release again in February. Although Adidas release lacks the motor, the app, and the whole Tech vibe, it supposedly still provides the custom fit you’re looking for. And for $180, which is around half the price of the Nike Adapt. The Nike Adapt BB, is Nike’s most tested design ever. Whatever it is you’re worried about, they’ve debunked. The amount of tests done on these is just nonsense. And the numbers we see prove it’s made for real high-performance. Tested against heat, humidity, and water. And it passed. So unless you’re a technophobe, there’s no reason to fear the shoe!